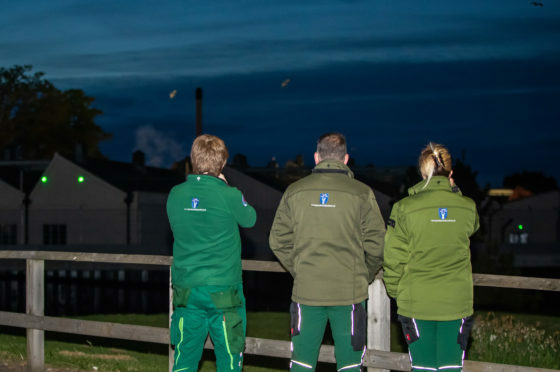 Specialist Vermin Control at work with their lasers within Elgin, Moray to disperse seagull pests. Gulls in Elgin have become increasingly notorious as they have become bolder and more territorial in recent years. Incidents in the town have led to food being lifted from shopping trollies, rubbish pulled from bins and unsightly mess. Now Elgin’s business improvement district (Bid) has recruited specialist contractors, Specialist Vermin Control, to use bright beams of light to unsettle the birds while they are nesting. Crews from the firm will be working in the town centre in the early hours of the morning until the end of July to encourage the feathered menaces to move back to the countryside and coast. Firm owner Rob Teasdale explained the technique had already proved successful elsewhere. He said: “We’ve used it at distilleries already. The staff there have found it amazing they can actually go outside again and enjoy a sandwich without being bothered. “The important thing is it doesn’t do any harm to the birds. It’s just an annoyance to them, eventually they just decide to go somewhere else. They see it as a physical threat and fly off. Several methods have been considered to tackle Moray’s feathered foes in recent years. The council considered deploying drones as part of the efforts to oil the eggs but abandoned the plans due to the costs. Signs have been put up throughout the town centre and on housing estates to deter people from feeding them. Bid manager Gill Neill said the group decided to take the “high-tech approach” instead of removing nests and eggs. She said: “City living is not their natural environment and the last few years have seen their numbers soar, so we knew we had to act. “You would be amazed the damage that is being done to the historic buildings and the number of reports we receive about people having food stolen or being attacked by protective parent birds has steadily increased.